351C with 35,000 miles - Need to rebuild? I have an early 1971 Pantera with 35,000 miles that is under restoration. There will not be any modifications to the car or engine, only restoration. The engine was probably last started about 20 years ago. It has oil in it and the crank rotates freely. I removed the cylinder heads and found no lip on the cylinder walls. My options are to completely disassemble it and do a light rebuild (or more if needed), or to simply reseal everything and use it as is. In either case it will run on a test stand before going back into the car making it much easier to correct any issues. Which approach would you use? Thanks! 1. Replace the valves with a quality valve and give it a good 3-angle valve job. The original valves are 2-piece valves, friction welded together, and they have been known to come apart with catastrophic results! 3. Re-seal everything and enjoy! However, if you can afford it, it would really be best to go through the whole thing while it's open; then you will know exactly what you have and what condition it's in. I've edited this post to include more information; i.e. part numbers, prices, specifications, and explanations for choices and recommendations. I've also sorted the information, put related thoughts under the same headings, and gave those headings titles. All in the hope to make this post more understandable and therefore more useful. Its 3 times the original length. 1. The Valve Heads “Break-Off” the Valve Stems While the Engine is Running – The factory valve heads are brittle, that's why they come apart. It has nothing to do with their 2 piece construction; the vast majority of automotive valves are assembled using 2 piece construction. Replacing the valves is the solution but the replacements don't have to be stainless steel; steel valves with stems designed for 4 groove locks will do the trick up to a rev limit of 6200 rpm. Just don't use Ford valves ... or Chinese valves. For instance Sealed Power sells the 1.710 inch 4V exhaust valves, p.n. V-1879, for $128 USD per set of 8, although they have no current listing for the 2.19 inch 4V intake valve. The smaller 2.041/1.655 valves (p.n. V-2075 and p.n. V-2030) are an even better deal at $136 USD for a complete set of 16 valves. 2. The Connecting Rod Big End Caps “Break Loose” During High Speed Operation – This happens because the threads strip out of the connecting rod nuts. The OEM rod nuts are just as failure prone as the OEM valves. Replace the OEM rod nuts with ARP p.n. 300-8381 nuts; 2 nuts per pack x 8 packs. 16 nuts cost only $32 USD. The OEM rod bolts, rated at 150,000 psi tensile strength, are fine up to 6200 rpm. 3. The Cylinder Walls Crack During High Speed (WFO) Operation – The thickness of the production block’s cylinder walls are nominally 0.160 inch thick (roughly 5/32 inch), which isn’t very thick. When pushed beyond their limits the cylinder walls crack. Those limits are about 8:1 dynamic compression, 7200 rpm, and 450 horsepower (peaking at 6500 rpm). There is nothing that can be done to strengthen the cylinder walls in street or circuit racing applications (drag racers use grout in the water jackets). Engines making up to 410 horsepower peaking at 6200 rpm or less, having no more than 8:1 dynamic compression, and rev-limited at 6200 rpm are in no danger of cracking cylinder walls as long as they are in good states of tune and their reciprocating assemblies are well balanced. The engine in your Pantera therefore requires no steps to be taken or expenditure to be made. Limiting engines with 4V cylinder heads to 410 horsepower peaking at 6200 rpm or less can be accomplished by limiting the lift and duration of the camshafts they are equipped with. Hydraulic tappet camshafts should have no more than 0.532 inch gross lift or 230° intake duration at 0.050; solid tappet camshafts should have no more than 0.524 inch net lift or 238° intake duration at 0.050. Engines equipped with 4V cylinder heads having bigger cams (higher output) and/or being set-up for higher rev-limits should be equipped with longer 351W or 302C connecting rods and forged round skirt racing pistons custom ordered with 1.492 compression height (351W rods) or 1.418 compression height (302C rods). Longer connecting rods reduce the thrust forces bearing upon the cylinder walls and round skirt pistons spread the thrust forces bearing upon the cylinder walls over larger areas thereby decreasing the magnitude of the thrust forces bearing upon any given spot. 1A. FIRST PROBLEM: The Hot Oil Pressure Runs Low (below 50 psi at 2000 rpm) – If the engine is coming completely apart, use the opportunity to install tappet bore bushings; the do-it-yourself installation kit available from Wydendorf Machine costs only $400 USD. Tappet bore bushings with 0.060 inch orifices prevent excessive oil flowing to waste at the tappet bores. After the engine is equipped with tappet bore bushings a standard volume oil pump shall supply plenty of oil and the standard relief spring built into the oil pump shall be able to control hot oil pressure at the upper end of the intended design range (i.e. 60 psi to 70 psi). Additional benefits include limiting the amount of oil supplied to the valve train and isolating the motion of the tappets from the main oil passages (which impedes oil flowing to the 3 central main bearings). 1B. Any 351C equipped car that may be driven vigorously should be equipped with a racing style oil pan; this includes ALL Panteras. The G forces generated during acceleration, braking, and cornering throw the oil in the pan against the side of the sump, and away from the oil pump pick-up. The hinged doors and baffles of a racing oil pan prevent this. No matter how well you prepare the lubrication system it cannot supply oil to the engine if the suction of the oil pump is not submerged in a continuous supply of non-aerated oil. The Aviaid p.n. 155-55365 Pantera oil pan lists for $438 USD, others are available at lower pricing. 1C. However, if you decide to keep the stock oil pan there were two factory improvements to consider duplicating. (1) The Q code oil pump pick-up was a better design than the M code or H code pick-up, duplicates are available from Melling (p.n. M84-AS1), Milodon (p.n. 18635), or Sealed Power (p.n. 224-11166) . 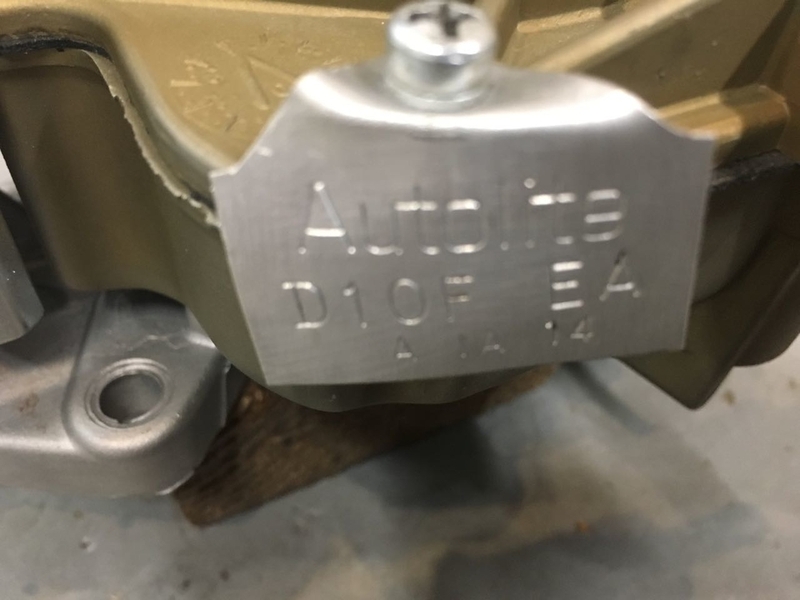 (2) A rudimentary windage tray, tack welded within the oil pan, was standard in the Q code engines; an aftermarket windage tray can be added to an M code or H code engine (Milodon p.n. 32220 or Moroso p.n. 22939). 2A. SECOND PROBLEM: The Rod Bearings are Worn or Damaged – The rod bearings are most likely in bad shape. Replace them with heavy duty CB927 tri-metal style bearings. The heavy duty bearings take the abuse of under-lubrication better than standard babbit bearings. If the journals are OEM diameter install the +0.001" style bearings and aim for 0.0022 – 0.0028 inch clearance. These “performance” clearances promote increased oil flow and reduced bearing temperatures. 2B. If the reciprocating assembly is coming out of the engine block set the rod side gap clearances at 0.018 - 0.022 inch, this also promotes increased oil flow to the rod bearings plus improved splash lubrication of the camshaft and cylinder walls. 2C. If the main bearings are coming apart replace them with heavy duty MS1010 tri metal bearings, which are FULLY GROOVED. If the journals are OEM diameter install the +0.001" style bearings here as well, shoot for 0.0025 - 0.0032 inch clearance. Fully grooved bearings supply more oil to the rod bearings. BUT with fully grooved bearings you can’t use 0W or 5W oil, use 10W30 oil; Valvoline VR1 is excellent oil for older engines. Acquiring fully grooved bearings may require using the upper shells from 2 sets of standard ½ grooved bearings (at an additional cost of $94 to $138 USD). 3A. THIRD PROBLEM: The Engine Boils-Over During Stop and Go, After a High Speed Drive, or On Mountain Roads – This is not a defect but a problem created by parts vendors. The Cleveland series engines DO NOT use the same thermostats as the SBF/Windsor series of engines. Yet over the decades (ever since the engine was new) most auto parts counters, including the parts counters at Ford and Mercury dealerships, have dispensed SBF/Windsor thermostats for Cleveland applications. Make sure the engine has the proper Robertshaw 333 thermostat installed. The thermostats sell for only $40 USD or less; if you need one it’s available from Marlin Jack or Tim Meyer. Also make sure the brass orifice is installed below the thermostat. 3B. There are 2 cooling system improvements to consider which are Pantera specific: (1) Replace the coolant pump pulley with the SACC overdrive pulley. (2) When the time arrives to replace the coolant pump consider the Flow Kooler pump which has a billet impeller intended to improve low rpm flow. 4A. FOURTH PROBLEM: The Positioning of the Crankshaft Damper’s Outer Ring Has Shifted on the Hub – This is not a defect, just a sign of old age. Nor is this a problem peculiar to the 351C, it happens to all “aging” engines equipped with unbonded crankshaft dampers. An unbonded crankshaft damper is held together by the stiction of the rubber sleeve located between the hub and ring. Any rubber sleeve which is over 20 years old has hardened and doesn’t have the stiction it used to have, plus it doesn’t dampen the crankshaft as well as it is supposed to. Replace the damper with a fully bonded damper, PowerBond PB1082SS. Available at Summit Racing for $215 USD, probably available via Tim Meyer too. • This is a must-have improvement. It reduces “misfires” which has several benefits including easier and faster starting, more low rpm torque, more horsepower at all rpm, fewer emissions and better fuel economy. The engine’s maintenance is reduced as there are no breaker points requiring periodic adjustment. Reducing misfires also makes an engine run smoother (less vibration) therefore a good electronic ignition reduces vibration and harshness. Since the forces causing vibration are destructive forces, reducing vibration indicates the magnitude of those destructive forces has also been reduced, improving an engine’s durability. The distributor calibration for most applications should be 20° centrifugal advance which begins advancing at 1000 rpm and is all in by 2800 rpm plus 18° initial advance for 38° total advance. Engines equipped with pop-up dome pistons may require more than 38° total advance to achieve full output, in those instances the distributor should be calibrated for 26° centrifugal advance which begins advancing at 1000 rpm and is all in by 3300 rpm plus 14° to 18° initial advance for 40° to 44° total advance. • Remove carbon build-up in the ring grooves. • Since the bores look good you have the choice to re-use the rings or deglaze the cylinders and install new rings. • Since the reciprocating assembly turns easily by hand we know the main bearing journal alignment is good and the crankshaft is straight. • If you remove the pistons to clean the ring grooves you’ll have the opportunity to at least visually inspect the crankshaft’s rod journals. • If the crankshaft is coming out of the block replace the rear main rope seal with a 2 piece neoprene seal. • If the reciprocating assembly is coming out of the engine block don't put it back in without having it spin balanced first. • Due to the engine’s low mileage the cam bearings can be assumed to be in decent condition. • You should inspect the condition of the cam lobes and tappets. • The nylon teeth on the camshaft sprocket are no doubt brittle. My recommendation would be to install a new timing set that doesn’t have nylon teeth. • If you’re replacing the valves as recommended the valve seats will most likely require servicing. A good machinist will want to service the seats to reduce run-out and set the widths and diameters properly. The top cut should be 70°, the valve seat angle should be cut at 45°, and the undercut should be 30°. The seat width of the intake valves should be no less than 0.060 inch, and the seat width of the exhaust valves should be no less than 0.080 inch. Valve seat run-out should not exceed 0.0010 inch. • If you’re installing stainless steel valves you should consider installing bronze valve guide inserts too for the sake of the valve stems. If you’re not installing stainless steel valves the guides will still need to be inspected for condition and for clearance with the stems of the new valves. You may still need to install valve guide inserts, if so install bronze inserts which have upper ends machined for spring loaded viton valve stem seals. Two possible choices are Manley’s guides p.n. 12084-8 or Sealed Power (Speed Pro) guides p.n. VG-7501R. The Manley guides are the correct length, the Sealed Power guides must be shortened to 1.625 inch below the flange. • Mill the heads a modest 0.010 inch to compensate for the thickness of the replacement head gaskets. The compressed thickness of Fel Pro’s p.n. 8347 head gaskets is 0.010 inch thicker than the thickness of the OEM head gaskets. Replace the parts which deteriorate with use or age, or parts which cannot be re-used. • This includes the crankshaft seal, valve stem seals, bearings (pilot bearing, throw-out bearing), gaskets, and rubber parts such as fuel system hoses, and the fuel pump (the fuel pump diaphragm is rubber). The sum of those parts and procedures equates to a more durable, smoother running 351C without the flaws of the original engine. The mechanical compression ratio is 9.51:1 and the dynamic compression ratio is 7.30:1. The engine will operate safely on 91 octane US/Canadian pump gas (equivalent to pump gas rated 95 octane internationally). It will produce 290 horsepower peaking at 5400 rpm, and require a 6200 rpm rev limit. Should have started with a compression test, then an accurate reading of the hot oil pressure at 2500 rpm. Apparently too late for that? 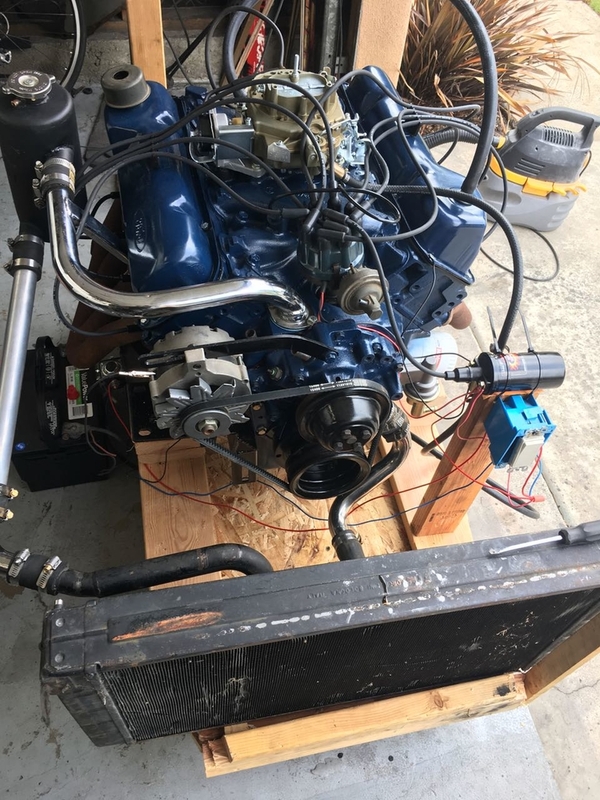 The project came to me with the engine out of the car. It would need to be in the test stand to get a compression test. I could put the heads back on and test it. But doing so will result in a lot of messy leaks. About the main bearing grooves, I thought like George that 360 ° was a good thing, but I read in the Clevite catalog a whole text that explains that a 180 ° groove is the best solution.....?????!!!!!! 28 ounce external..hope no mistake, was more expensive though! Cleveland series engines have always had problems with low hot oil pressure and connecting rod bearing damage. The problems were interrelated because rod bearing damage is what drove the oil pressure down. These issues were not isolated to engines operated at high rpm; even 2 bbl carbureted engines operated strictly at low rpm in mundane transportation applications developed these issues. The “strategy” to adequately lubricate the rod bearings varies to some degree depending upon whether or not the production reciprocating assembly is in use. Some folks suspect that the oil passages drilled within the OEM crankshaft may be in part responsible for the difficulty in lubricating the rod bearing journals. Others point to the weight of the OEM connecting rods and the associated pistons. Most folks with experience dealing with these issues will agree there is something making it difficult to lubricate the rod bearings adequately. Whatever that problem may be, it’s a long established precedent to use fully grooved main bearings in applications involving the OEM crankshaft because they more than double the amount of oil flowing to the rod bearings, and the extra supply of oil is needed to adequately lubricate them. This is not a new idea that originated with me. Fully grooving the main bearings accomplishes the same thing as cross-drilling crankshafts once did; it supplies lubrication to the rod bearings through 360° of crankshaft rotation thus more than doubling the amount of oil supplied to the rod bearings. The factories did not cross-drill cast iron crankshafts for fear it would weaken them, thus the main bearings were fully grooved instead. Fully grooved main bearings were standard equipment in the Boss 351, and were once standard in all heavy duty bearing sets for the 351C. There have never been any problems or issues arising from the use of fully grooved main bearings; the 351 Cleveland has never had any problems in regards to lubrication of the main bearings. However with the advent of modern low viscosity oil (0W and 5W) the bearing manufacturers no longer manufacture fully grooved main bearings because the groove in the lower half of the main bearings channels low viscosity oil away from the gap between the bearing and crankshaft much like the rain grooves of a tire channel water from between the tire and the road. The solution here is an easy one, don't use 0W or 5W motor oil. This is why I always very specifically specify using 10W30. Clevite once included fully grooved main bearings with ALL of their heavy duty bearing sets for the 351C. Unfortunately a “corporate” change in policy regarding fully grooved main bearings does not take into account the needs of specific older engines. They focus on main bearing performance which has never been an issue for the 351C, while the subject of reduced oil flow is disregarded. If the main bearings aren't fully grooved, but additional oil to the rod bearings is needed, how are you going to accomplish delivering additional oil to the bearings? There is no alternative solution provided! Without a doubt modern motor oils are better performing than the motor oils of decades past, but owners continue to find excessive wear occurring to 351C rod bearings (the silver colored top layer of heavy-duty bearings wears away exposing the copper colored layer below). For this reason I consider it counter-productive to do anything that would reduce the amount of oil supplied to the rod bearings in 351 Cleveland applications utilizing the factory iron crankshaft, factory connecting rods, or pistons weighing close to the weight of the OEM pistons. The Holley '650' CFM is a 'Double Pumper' Having Mechanical Secondaries. The Demon p.n. 1282020VE is a carburetor exactly as I described. a "street performance" tuned 650 cfm Holley style carburetor, annular boosters, vacuum secondaries, electric choke. It has been discontinued, but can still be found for sale on eBay, Amazon, etc. Quick Fuel also sells vacuum secondary carburetors rated 680 cfm such as the SS-680-VS, but they lack the annular booster venturis. Do you think Quick Fuel would special order one with the annular boosters from the SS-650-AN double pumper? By the way, Quick Fuel and Demon are both Holley companies now. The "other" small four barrel carb with annular boosters is the Summit Racing p.n. M08600VS, which is indeed rated 600 cfm. 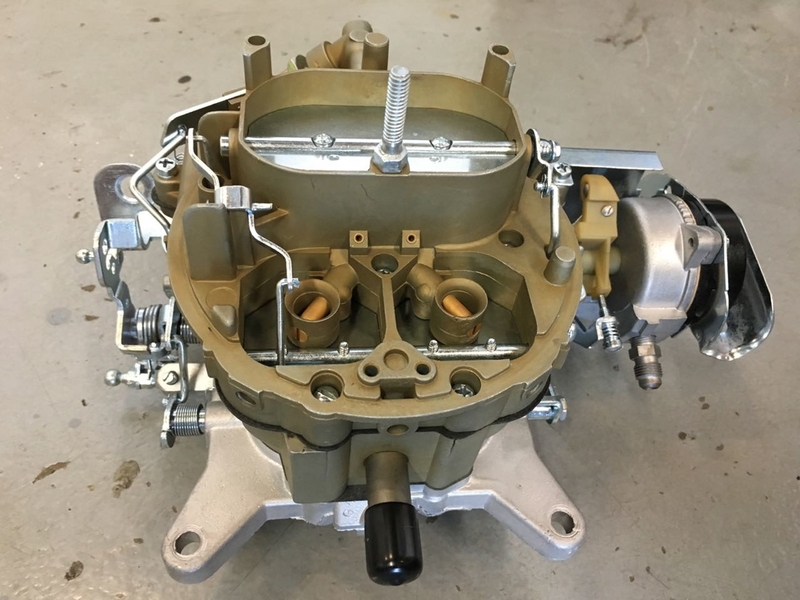 (1) Toss the emissions tuned Autolite 6300A carburetor and replace it with a "street performance" tuned 650 cfm Holley style carburetor, annular boosters, vacuum secondaries, electric choke. The 4 holes in the intake manifold would need to be opened-up to 1.7 inches diameter. Could you share the Autolite number? I have two but could not figure out the number tag being correct. I read this post with great interest Mr Pence has a fountain of engine knowledge can you help with my query please, the rear main was leaking oil, so I removed the engine to change the seal. Its not common to see wear on the main bearings. Especially #5. Keeping that in mind I'd first suspect an assembly issue. For instance the bearing may not be seated well in that location because a spec of dirt found its way under the bearing during assembly. Or perhaps a drop of some chemical found its way there during assembly. BUT the wear is clocked on axis with cylinders #5 through #8. That's probably not a coincidence. This could indicate several problems with one of those cylinders. 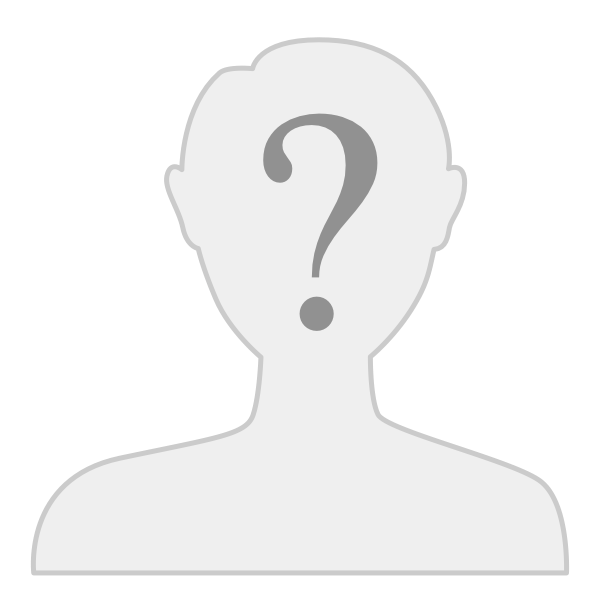 An ignition issue, a lean cylinder, a bent connecting rod, a balance issue, a crankshaft damper issue. Inspecting the other 4 main bearings may help in determining which cylinder in that bank has an issue. BUT ... the exposed copper area does not appear (in the photo) to have signs of mechanical wear that would go along with these things. By mechanical wear I mean visible ridges, lines, grooves, craters, etc. 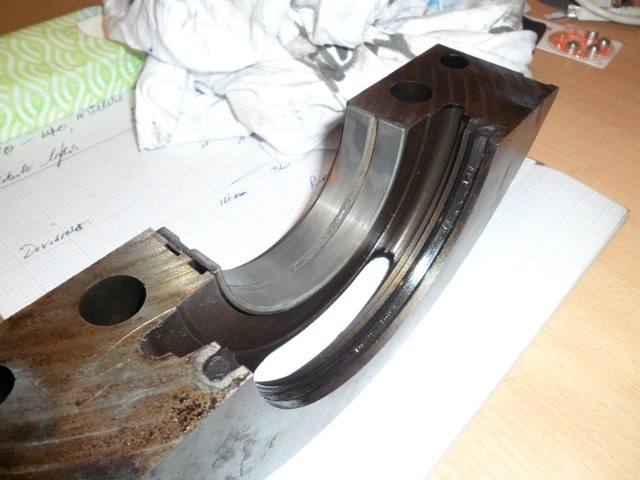 When bearing damage occurs without signs of mechanical contact with the crankshaft journal I think its normal to assume its caused by cavitation or corrosion. Did you guys notice its a fully grooved main bearing? Thanks very much for your help, To be truthful I am a member of the "if its not broken don't fix it" brigade and didn't take off the other caps to inspect them. But the Cranshaft damper was in very poor condition, now renewed. recently I took the car to a rolling road, where timing problems were discovered, the wrong kind of plugs fitted, and the secondary jets never coming into play, because the geometry of the new holley carb accelerator was wrong all now sorted and the difference in the cars performance is manifold. So it would seem that these faults or some of them could be the cause of the coppering on the bearing. Just as an aside I have genuine Factory paperwork regarding the engine in my car, the original engine dropped a valve destroying the engine. A "new" one was fitted by the factory, but when I looked at the bearing it wasn't a standard size but 10 though under, I doubt that the owner was informed!!! I have the engine on a stand and have been methodically disassembling and cleaning it, and checking for signs of wear. Main bearing #3 showed .003 clearance and looked nice with no copper showing. One of the rod bearings also looked good and showed about .002 clearance and no copper. The camshaft sprocket for the timing chain is steel in lieu of nylon and looks healthy. My plan at this point is to finish cleaning it and start reassembly, sealing, and painting. Then put it on the test stand and run it. This allows for doing a compression test and oil pressure check. Any leaks are also easily fixed. If compression or oil pressure are incorrect then they will be fixed as well. The only risk with approach is a gasket set and some time. For those inspecting engines by pulling rods or main caps: finding a copper layer is noteworthy, but it only happens with tri-metal bearings. There are also bi-metal bearings in common use which do not use a distinctive copper flash-coat. With these, you need some experience and common sense in evaluating damage. And a set of micrometers! Jack, thanks for the heads up on the bearing materials! I started the engine today on the test stand and the results are good thus far. Oil pressure is 75+ PSI even when the engine began to warm up. Oil is Valvoline VR1 20/50. The valve train sounds good. Compression on cylinder #1 read 180 or so. But my compression gauge is old and it is best to start over with a new one to complete the test. The only issue thus far is smoke (black I think?) from the right exhaust on restart. The exhaust looks and sounds good when the engine is running. I plan to complete the compression test tomorrow and will post the results. If this is an original engine, never rebuilt, it was designed for 20W40 oil. Most of this engine's life, the most popular oil, high performance or transportation duty, was 20W50. I will switch to a lighter weight oil, probably 10/40. But wait. Aside from single viscosity offerings, Valvoline VR1 only comes in 20/50 or 10/30. Stock Pantera engines need zinc for the flat tappet cam and VR1 is one of the few oils made today that still contains zinc (they took zinc out of oil because it fouls catalytic converters). George noted that 20/50 has been the most commonly used oil in stock Pantera motors. It looks like I may just continue with 20/50. I have been using it for a long time without issues. Here are the compression test results. I'm not sure about the accuracy of the gauge but the following is good for comparison between cylinders. There are two readings for each cylinder, dry and wet. Dry was taken with the engine warm. Wet was followed by the dry test but a teaspoon of oil was squirted into each spark plug hole. 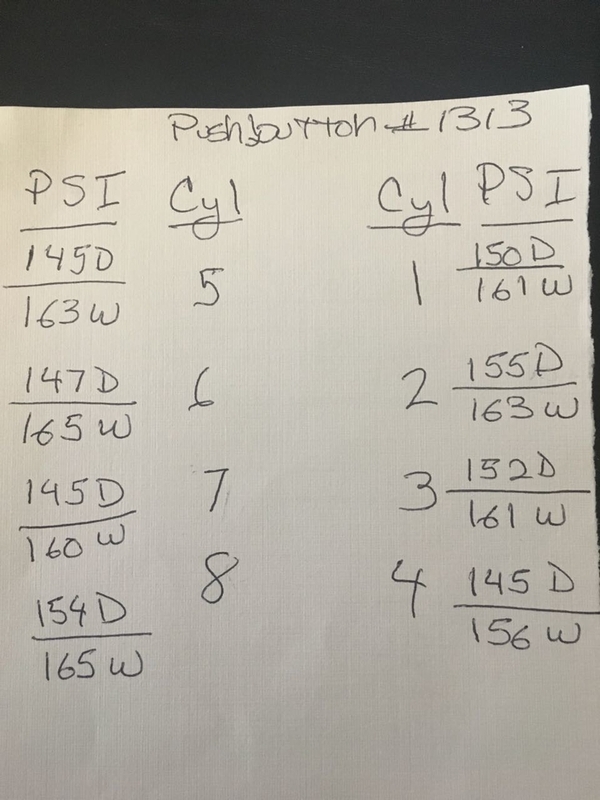 Are these readings healthy for a stock 1971 351C? If not, should it get new rings? i thought we were in the 10-30, 10-40, 15-40 zone with factory clearances? i don't see anything alarming enough to tear it down tonight, for more technical insight do a cylinder leak-down test. did you have all the plugs out and the throttle wedged open the whole time? The spark plugs were out for both the dry and wet tests but the throttle was sitting at idle. Today I warmed the engine up again, pulled the spark plugs, and used a spring to hold the throttle wide open and then retested. Today's compression test yielded the same results as yesterday. I will proceed with the leak-down and find the pressure loss for each cylinder. not only psi loss but where it's going, listen for the air at the carb, exhaust and valve cover. Here are the leak down test results. I could only find air escaping through the oil cap breather. Can anyone provide guidance on interpreting the results of the leak down test and compression test. The engine runs well but now is the time to work on it since it is out of the car and on a test stand. sorry i forget where you're at with the whole project, this engine still has factory vales in the heads or you've replaced them? I have not replaced them. But when the heads were off I could see that some were Ford valves and others were unmarked. I pulled one of the valves and the seat looked good. And its seal looked good as well. The engine may have had a valve job. i don't know what to say, running them is risking it all. I will get the cylinder heads serviced including new valves (not Ford or Chinese as per George). The engine will get new piston rings and cylinders honed, and this should bring compression test results up to the 175-180 PSI range. The leak down test results should also improve. The rod nuts will get replaced with ARP. Since oil pressure is good I plan to keep the bearing unless I can find issues during the complete disassembly. I don't plan on any other changes since the engine is currently running nicely on the test stand. The bearings, mains and rods, are really not expensive, it would be a shame not to replace them. The compression and leak down tests look pretty good to me, an even spread within 10%. Presumably on a 71 you have closed chamber heads? I would replace the bearings and probably the oil pump as part of any tear down. If this is an original engine get a decent (non Chinese) timing chain set. Note there are various ways of doing a leak-down test and interpreting same: mine is to use a dual-gauge system starting with 100psi in the chamber. Using 100psi to start gives you % leakage directly. Run the test cylinder's piston to TDC, put the car in 1st gear and check the gauge reading after exactly 120 seconds (2 min). Note-100 psi in a cylinder may cause an unrestrained engine to move the crank slightly, spoiling the test. Over 15%: there is metal missing somewhere in the combustion chamber; a general overhaul will soon be needed. Repeat for all cylinders and also check for big variations between cylinders as with a compression test. Some shops specify only a hot engine, some take a gauge reading right away for % leakakage or after some other duration, and some always wear their 'lucky' socks. You can do a quick diagnosis on potential trouble spots by listening for air flow in carb (intake valve seal), air flow in tailpipe (exhaust valve seal) or air or bubbles showing in rad tank or in valve cover breather cap (head gasket problems).